The Mollie Makes series of books contains multiple projects for the home using techniques for every crafter. 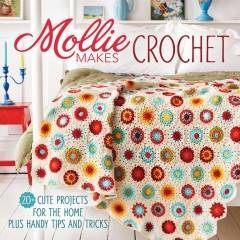 Mollie Makes is a lifestyle and craft magazine for homemade crafts and now they’ve added books to their line. Interweave sent me four of the Mollie Makes books, so we’ll take a quick look at each of them. Molly Makes Crochet is a bit larger than the other books and includes 14 crochet projects for the home. The book cover says it has 20+ projects and I can only assume they are counting some of the flower variations for the Bouquet of Flowers project, the doilies, and potholders. The book starts with how to work from patterns and information on gauge, followed by the patterns, and finishes off with techniques used for the different projects. These techniques include hooks and yarns, basic crochet stitches, joining new yarn, working in round, motifs, tubular shapes, shaping, decorative, textured and lacy stitches, edgings, surface crochet and embroidery, and finishing off. Projects include placements, flowers, four blankets, Russian dolls, doilies, iPad cozy, a chair runner, two pillows, pot holders, and gadget covers. Each project includes a listing of materials and methods, sizes as needed, a few words about the designer, gauge (of course), featured techniques (which you can find at the back of the book), a crochet story, a “before you begin” section, photos, text instructions, and symbol charts as needed. 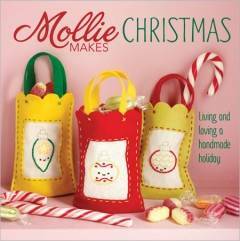 Molly Makes Christmas includes 21 projects for the holidays and covers everything from ornaments to stockings to banners and more. No matter what craft you prefer, this book covers it with paper crafts, felt projects (including a needle felted cottage), sewing, crochet, and knitting. There are also four pages of inspirations with links to the sites where you can find the designs. Please note that the pattern or item may not be a free pattern. Crocheted projects include an amigurumi reindeer, a granny square garland, carrots for the reindeer, and a bottle and mince pie for Santa. Knitting projects include baby booties with beads, a cushion, a sachet pillow, and a pair of fair isle fingerless gloves. The rest of the projects cover using felt, paper (folded and cut), fabric, ribbons, and more. Each project includes the necessary list of materials, instructions, a few words about the designer, templates and tips as needed, and plenty of photos. No matter what your skill level, you’ll find several projects you can complete quickly for gifts or to decorate your home for a folksy Christmas. 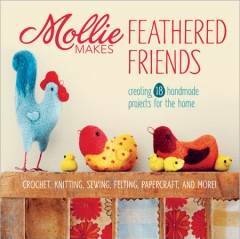 Mollie Makes Feathered Friends includes 18 projects for different types of crafts that include birds. Like the Christmas book, projects include crochet, knitting, sewing, papercrafts, needlework (embroidery & cross stitch), stamping using a lino cut, felting, sewn and glued felt projects, Also included are four pages of ideas along with links to the sites where you can find the designs. Please note that the pattern or item may not be a free pattern. Crocheted projects include a penguin pillow, amigurumi nesting chicks, and a granny square blanket with some bird granny squares, One of the ideas is an adorable owl banner, just go to the listed website to purchase the pattern. There is only one knitted project, a felted Intarsia purse with dancing birds. Each project contains a list of materials, a few words about the designer, instructions, templates and tips as needed, and plenty of photos. 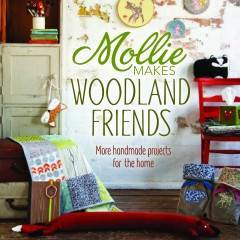 Mollie Makes Woodland Friends includes 18 projects for different types of crafts that include animals that live in the woods. Projects include crochet, knitting, sewing, papercrafts, needlework (embroidery & cross stitch), felting, sewn and glued felt projects, Also included are four pages of ideas along with links to the sites where you can find the designs. Please note that the pattern or item may not be a free pattern. Crocheted projects include a tissue box cover, amigurumi chipmunk, badger, and wolf shelf ornaments, and finger puppets – bear, moose, rabbit, and fox. There is only one knitted project, an adorable fox draft dodger. Each project includes a list of materials, instructions, a few words about the designer, and templates and tips as needed, and plenty of photos. My favorite projects in this book are the hedgehog sewing set (hedgehog pincushion leaf-shaped needlecase, and acorns to attach to your scissors), the fox draft dodger, badger pillow, and fox sleep mask.